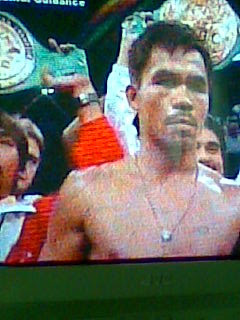 The Filipinos are once again victorious over the winning of Manny Pacquaio in his fight with American boxer Diaz. The 12- round bout ended on the 9th round with Diaz on a knock-out from a super punch hurled by left- handedPacquaio. He is such a power fighter but a kind-hearted one. He looks worried when Diaz knocked down as it is always his prayer to start every fight with nobody getting seriously hurt in the end. The clock stopped for Filipinos to watch, over Manny's fight with Diaz, at the GMA Channel that help a replay of the game. He is now a 4-time champion and he deserves indeed to be called a pound-for-pound king. The boxing was held at Las Vegas, yesterday. Congratulations, idol! Hurray to Manny and to all of us, Pinoys !